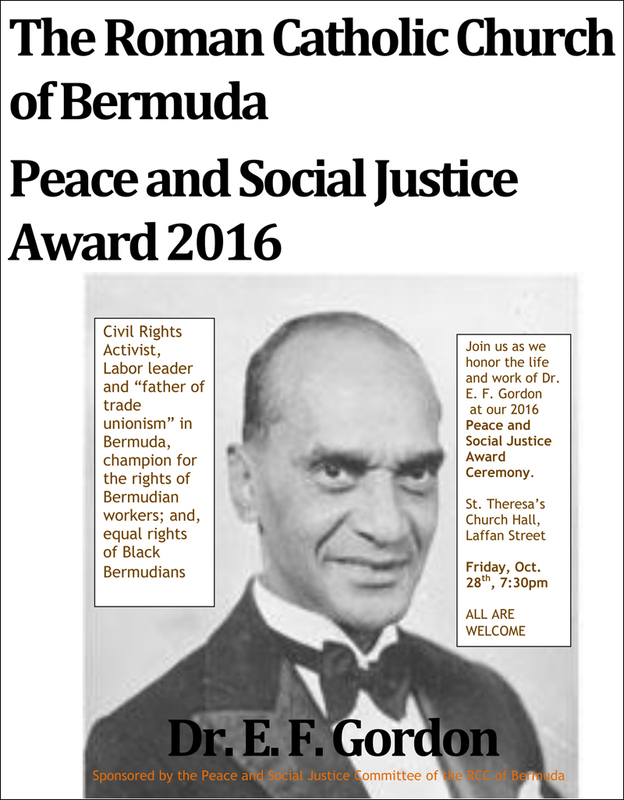 The Peace and Social Justice Committee of the Roman Catholic Church of Bermuda is holding its Peace and Social Justice Award Ceremony on Friday, October 28th at St. Theresa’s Church Hall on Laffan Street. “This year’s honoree for the Peace and Social Justice award is the late Dr. E. F. Gordon, a Bermuda National Hero, Civil Rights Activist, Labour Leader, and champion for the rights of Bermudian workers and for equal rights of Black Bermudians,” the Church said. “Dame Pamela Gordon and Minister Patricia Gordon Pamplin [Minister of Community, Culture and Sport] are both expected to be there on behalf of their father and will speak for the Gordon family. The former leader of the BIU, Mr. Ottiwell Simmons, will also speak at this event. “Dr. Gordon is the Roman Catholic Church Peace and Social Justice Committee’s sixth honoree. “He is preceded by the following: Dr. Barbara Ball  for her contribution toward labour and union rights; The Progressive Group  for their contribution toward desegregating Bermuda through the Theatre Boycott; Dr. Dorothy Thompson for her contribution for the rights of quality education for girls; Monsignor Felipe Macedo  for advocating for the rights of Portuguese immigrant families in Bermuda and Gladys Misick Morrell  for her contribution as the leader of the Suffragette Movement in Bermuda. Well deserved, but when your offspring endorse a system that you fought against ………………. You’re not a victim no matter how much you want to be. Like how some people are not undeserved privileged inheritors. Perhaps his offspring are much more forward thinking than you could ever hope to be and are working toward peace instead of the continued hate that you portray in every post you make, Onion Juice. Well, how come we NEVER see de offspring of de Gibbons , Trimminghams etc. supporting P.L.P or Union Labour. Wich is still evident today, I might say. Only because people like you expect handouts instead of working towards a goal. The only skill you have is playing the victim, grow up and shut up. Racial injustice is alive and well, subliminal in Bermuda but in U.S. its life or death. Perhaps the church should also recognize the rights of equality for the LGBTQ community. Martin Luther King’s right hand man was gay. “Gays are beginning to realize what Blacks learned long ago, unless you are out here fighting for yourself, then nobody else will help you. He was too busy clicking ‘dislike’ and refreshing the page.